I had a lot of fun this weekend! Despite a few sore muscles in response to my "chores and fun times", I felt like the weekend was productive. It allowed me to get away from some of the routines that can wear you out. The weekend actually started out bad due to a broken down car (transmission failure--very expensive). We towed it to a helpful garage from a less than helpful one late Friday! The drive was long and the conditions not the best but we had the time to talk to a son and daughter in law we were helping! We took advantage of tough times and some major frustrations to enjoy their company. Then we stopped at a store offering some specials and got our mid grade gas for $2.57 a gallon. We filled up with less than $40! We bought some salmon and other fish for dinner and the freezer and then enjoyed a late but scrumptious meal! Saturday arrived early and we were working on projects outside by 8 after some coffee and a bagel. Activities included getting the garden ready for spring by picking the last vegetables (brussel sprouts) and then spreading organic fertilizer--yep it stunk. Inside the house Deb prepared the sprouts for freezing. She then joined me outside to help take down a couple of dead and ugly trees with our trusty chain saw. Deb loves bonfires so we started a big one and she stoked it with the branches from the trees while I made fence railings with the trunks. We ended a busy day in time to enjoy another relaxing meal with fish and some of the sprouts with fresh biscuits. Sunday included some family time with sons and families and some more tree cutting. We pulled down a good sized one and a dead branch next to it with the 4 wheeler! Very handy vehicle to help with that type of project! 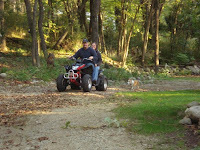 Of course, after we worked hard (we moved some logs weighing 400-500 pounds) we had to run the 4 wheeler around the back 40 pasture area! :) Grandsons got rides, son and daughter in law raced a timed course and we laughed a lot! After dinner we had some apple crisp and watched America's Funniest Home Videos! Some more good laughs for everyone! What do you for laughs and relaxation? We recognize that there may be times when you can't find the time to relax but it will make your family stronger if you can laugh together! PS: I would have posted a video of the tree coming down with some help from the 4 wheeler but the son's phone camera which I used had a backward lens on it. Took a fine picture of me but missed the tree completely! Haha! Newfangled gadgets!